Every time I turn around, I find another personal connection to an artist doing sick, amazing work within the vein of comedy and/or the grotesque, and I kick myself that they are not in the issue of the zine that is coming out. Usually, it bums me out that I am not going to be giving an artist that I love exposure through the zine, but in Allyson’s case, that is not an issue, having just been featured in the most recent issue of Juxtapoz! This Friday September 10, 7-10, check out “An Unearthly Child,” opening at Cinders Gallery in Brooklyn. 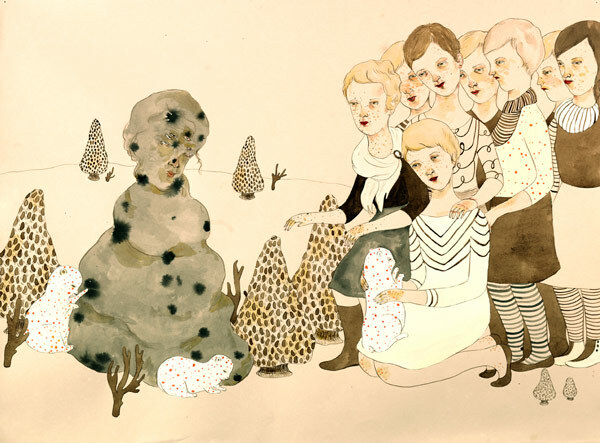 I would not call Allyson Mellberg’s work a melding of comedy and the grotesque as much as it is pure grotesque, although seeing the comedy in her deformed bodies and post-toxicity humanoids might help you keep your sanity a bit–they are, after all, products of a toxic world not unlike our own. Actually, this most recent work seems to doing some new stuff, in terms of color and playfulness. Nevertheless, her stuff will take you over the edge–with its craft, imaginative flair and heavy, otherworldly dread. Follow the links for some pictures. If you are in New York, come check it out!